This past February, I did the Mount Toubkal trek in Morocco. (Clearly I didn’t get enough of hiking on the Camino de Santiago.) This was my first experience in the Atlas Mountains, and I was happily surprised to find snow in Morocco, a place I had previously thought of as hot and dry. I had a friend visiting me for a few weeks and we had heard of the village of Imlil, which has a reputation as being a Morocco trekking destination. After a couple days in the chaotic city of Marrakech, a trip to the mountains sounded appealing. Mount Toubkal is the highest mountain in Morocco. I didn’t necessarily set out with plans to hike it. I went to Imlil just to check out the town and figured I might as well give it a go since I was already there. Appreciating the shopping opportunities in Marrakech. It seemed like lots of tourists arriving in Imlil were getting there by private taxi. It takes a few hours, so that’s a pretty expensive ride from Marrakech to Imlil. The alternative that I recommend is to go by grande taxi, which is basically just a shared mini-bus. Go to the Sidi Mimoun Terminus 2 Bus Stop and ask for Imlil. You’ll know you’re in the right place because there will be white mini-buses. There’s no bus schedules online or buying tickets in advance. Just show up and ask which grande taxi to get in. It doesn’t leave until it’s full, which could take a few minutes or an hour. Who knows? The drivers will help you get where you need to go. I paid 50 dirham (about $5) to get from Marrakech to Imlil. I switched taxis three times along the way, and each time the driver took their share of my 50 dirham and passed the rest onto the next driver. I always find local transportation to be preferable to taxis because the price is lower and I feel like I get the local experience. We rode along the winding roads through the mountains, wind whipping in through the windows, bags and bundles strapped to the roof, and everyone crammed up next to each other. It was truly a fun way to travel. Smiling because I don’t know how far I still have to go. We booked a couple nights in Gite Atlas Mazik in Imlil because it had such good reviews. Oh man, it did not disappoint. The owner’s son met us in town and walked us up the hill to the guesthouse. I met different members of the family along the way, who were headed in the same direction. We had a cozy room in the large family home. My floor had a terrace that overlooked the town of Imlil below me. In the morning there was a big Moroccan breakfast: bread with different jams to choose from, olives, eggs, and a pot of mint tea. They even did dinners at night time, alternating between couscous and tagine (a meat and vegetable dish that is cooked in a special clay pot). It was the most mellow and welcoming place to stay. When we organized our trek for Toubkal, they stored our unneeded luggage until we returned. I thought this would be the top, but sadly it was not. Is Mount Toubkal Safe Now? Guides are mandatory for Mount Toubkal now. They had a tragedy in December of 2018 where two tourists were murdered. It’s uncertain whether this will be a permanent rule or not. There are multiple police check posts along the way, and they will not let you pass without a guide. I would not let that tragedy deter you from hiking Toubkal, as the mountain is heavily policed now and you’ll be with a guide the entire time. We went to the Bureau of Guides in Imlil. The price to hire a guide is $50 a day or $100 total for both days, plus a tip. This is not per person, so if you have multiple people hiking you can split the cost. The most cost-effective way is to hire a guide once you’ve already arrived in Imlil. Rates listed online via trekking agencies are double and triple the price of what we paid. Make sure the guide has a yellow card that shows they are certified and legitimate. If you’re hiking Mount Toubkal in the winter, you will need crampons. Your guide can take you to rent a pair (or you can do it on your own). I went on my own to rent crampons and found out after already paying 100 dirham ($10) for my rentals that the price should actually be 50 dirham ($5). Another thing to do before setting off for your hike is to book a reservation at the Mount Toubkal Refuge. They need to know ahead of time that you’re coming so they can cook enough dinner. I paid about 350 dirham ($35) to stay in a bunkhouse in the refuge. This price included breakfast and dinner. Getting to the top has got me smiling. Beginning from Imlil, it takes about five hours to reach the refuge. It’s not too steep, it just takes a while. The scenery is beautiful. Lots of views of snow-capped peaks and the desert valley below. We brought snacks for lunch for both days, which I recommend. There’s also a restaurant halfway up the mountain if you prefer to eat there. We shared the path with lots of mules who were carrying supplies and gear up and down the mountain. There were also loads of other trekkers doing the same hike as us. Our guide seemed to be quite popular, as every local we passed by seemed to know him and want to stop for a chat. Finally, as we approached the refuge, I could see the need for crampons. Everything higher than the refuge was snow packed. After a dinner of tagine, our guide told us our start time would be 5 am. I’m not much of a morning person, so I was not pleased with this. But he told us it would take 3 hours to reach the summit of Mount Toubkal, then 2 more hours back to the refuge, then 3 hours to get back to Imlil. Good thing I brought some crampons along. I definitely needed them. Everything up until the refuge is just the same as it would be in warmer months, albeit probably much cooler in temperature. After the refuge is where we got into mountaineering. Our 5 am start time didn’t quite happen as planned because I slept through my alarm and woke up at 4:55. After hurriedly packing up and having a quick breakfast, the three of us put our crampons on and got going. The hike up was steep. We walked with headlamps for a couple hours. I have a fear of heights and often get anxiety doing things such as climbing bottomless mountains in the wee hours of the morning. I couldn’t see past where my light shined and because of how steep it was, I was convinced that everything below me was treacherous. I was scared of slipping and falling. Finally, the sun began to rise and my fear dissipated a little. It definitely was a steep mountain, but there were no scary drop-offs. After 3 hours, we reached to summit and had 360 degree views to enjoy. Then it was time for the long walk back down the way we came. My view from the summit of Mount Toubkal. Thankfully, since this is only an overnight trek you don’t need to pack too much. Just leave your extra stuff at your hotel in Imlil. Keep in mind when choosing clothes to bring that this part of Morocco is conservative. I would advise hiking in pants and a t-shirt that covers your shoulders. 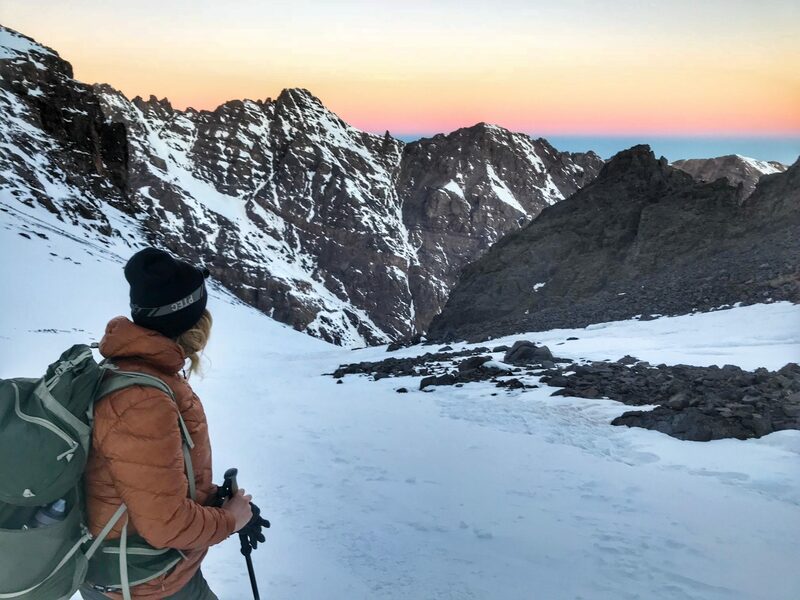 Overall, I’d say Mount Toubkal is a fun and worthwhile overnight hike. The mandatory guide rule does increase the price a bit, but Morocco is so budget friendly anyway that I made up for it in other ways. Plus, you can’t beat mountaineering in an otherwise desert environment. Thanks David! I’ve always wanted to make it up to Alaska. Awesome adventure Megan, great local knowledge, pictures made me feel like I was there. Great stuff, and so different from the Camino! Yeah, it’s so different. But not that far away from each other.